When we begin to recall the Venerable Sergius, we cannot then forget him. PRAVMIR. On July 9, 2014, at the ITAR-TASS Information Center, a press conference was held dedicated to the upcoming celebration of the 700th anniversary of the birth of St. Sergius of Radonezh, which will take place in the cities of Hotkovo and Sergiev Posad. “I want especially to thank Patriarch Kirill of Moscow and All Russia, who is the Holy Archimandrite of the Trinity-Sergius Lavra, since had he not appealed to the plentitude of the Church with a reminder about the anniversary, or appealed to the President of the Russian Federation, we probably would not have witnessed today the grandiose work and wave of spirituality in society that we witness today. “Speaking of St. Sergius, I first of all want to remind you that the time of St. Sergius was one of disaster, turmoil, and civil war that is much more terrible than war, just as war is more terrible than peace. St. Sergius was able to overcome the troubles in his mind and, using the figurative expression of St. Seraphim of Sarov, attained sanctity during his earthly life, gathering together a school that helped people move closer to sanctity. “St. Sergius is the Abbot of the Russian land. No other saint has been called this. It would seem that the Russian land does not consist only of monasteries, but he is called the Abbot of the Russian land because he intercedes for all those Orthodox Christians who live not only in Russia, but also throughout the world. “The meaning does not lie in the celebrations, some of which have already begun, that will take place on July 17-18 and October 8, but rather in something else: it is in the fact that, with the Patriarch’s blessing, we are at a new starting point. When we begin to recall the Venerable Sergius, we cannot then forget him. And those celebrations that are planned and already underway this year will also take place next year, for the 700th anniversary is not much different for us than the 701st, 702nd and 703rd ​​anniversaries. There just had to be an impulse. And Patriarch Kirill gave this impulse. This impulse awakened us, made us wake up and remember that the troubles that surround us occur only because we forget the most important thing: no matter how much we pray to the saints, they cannot help us if we are unwilling to change ourselves. 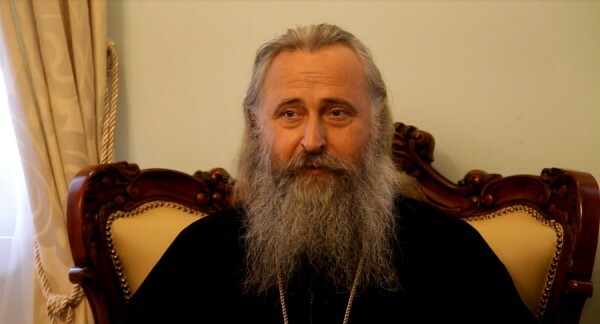 “The Holy Hierarch Philaret, Metropolitan of Moscow, spoke these wonderful, key words: ‘God created us without us, but he cannot save us without us.’ If we do not do anything to attain salvation, then even the Almighty God cannot save us. And the Venerable Father Sergius, through his life, showed the possibility of overcoming evil, above all, inside himself, overcoming the troubles in his own mind, and overcoming falseness. He overcame all evil. And that is why he was so respected by all. The most severe people of the fourteenth century fell silent in awe before the words of St. Sergius. “He was not a preacher. He did not leave behind any written works, just a few lines of his heritage, and even those in oral form; but his inner strength, not only his conviction, but his strength and holiness are what overcame the hated discord of this world. The wonderful chronicler writes: ‘How St. Sergius came to Oleg of Ryazan, this stubborn and severe man of the fourteenth century’ (this is how he was described in the chronicles), ‘a man who had spent his whole life fighting battles, and how Sergius with meek and kind words convinced Oleg to ask for eternal peace with Moscow.’ It would seem that this monk of the distant Radonezh lands is no one to Oleg of Ryazan, yet the strength of St. Sergius overpowered him. “And today it still overpowers. If we lack this power, it is only because we do not want to do anything. Therefore, this is the great value of this feast day, for it is just the beginning, a reminder to us all that we are all the heirs of St. Sergius, and that all of us are called to overpower evil, especially in ourselves, because ‘if you attain salvation yourself, thousands around you will be saved.’ These words of St. Seraphim of Sarov relate to everyone who lives on earth.